Dolnje (Lower) Zilje is named with reference not so much to elevation, but to direction of flow of the river Kolpa (it flows from Upper Zilje to Lower Zilje). This is the part of Zilje that is closest to Preloka, and this is evident in the local vernacular when compared to the language of Upper Zilje, which has more influence from Vinica. Dolnje Zilje is actually closer to the hamlet of Balkovci than to Srednje Zilje. Dolnje Zilje is also the home of the school. 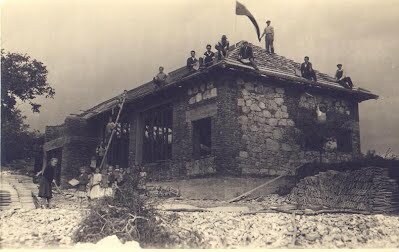 Students from Zilje stopped going to the school in Preloka near the end of World War II, and began classes at the Žuglji household. A new building for the school was built in 1953, and classes were held there until the 1970s. The original inhabitants of Dolnje Zilje are likely families with surname Balkovec. The Tax Register of 1674 lists only one individual with the Balkovec surname, Thome, who holds one or two mills on the Kolpa, although we cannot say his household was in Dolnje Zilje. But the 1690 register now mentions 11 Balkovec families in Zilje, headed by Marko (a blacksmith), Jurica, Grge, Jure, Pavel, Peter, Ivanec, Mikula, Martin, Mihael, and Jurina, with a total of about 5 Hübe. It is also very likely that Čadonič families originated in Dolnje Zilje. The 1690 register records 5 Čadonič families in Zilje, headed by five brothers (Miho, Pere, Mikula, Ive and Jurica) each holding 1/5 Hübe, suggesting they were equal heirs to their father’s one whole Hübe, although this theoretical father is not mentioned in the 1674 register, suggesting he arrived in Zilje between 1674 and 1690. These facts coincide well with the data from Church records of the late 18th century. Dolnje Zilje was, at this time, populated overwhelmingly by Čadonič and Balkovec families. In fact, there were no Čadonič or Balkovec families anyw here else in Zilje (except at the Maradini in Srednje Zilje). 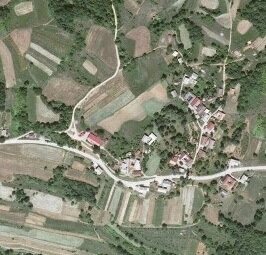 In the early 19th century we have 13 households in the area: 5 with surname Balkovec (Petrišini, Grujini, Vuki, Hajduki, and Škrpelari), 7 with surname Čadonič (Gornji Miheli and Dolnji Miheli, Košuti, Krčmari, Oficiri, Lanarkini and Markovi) and one with surname Žugelj. By 1900, we have added 4 new households, all offshoots of the earlier 13. 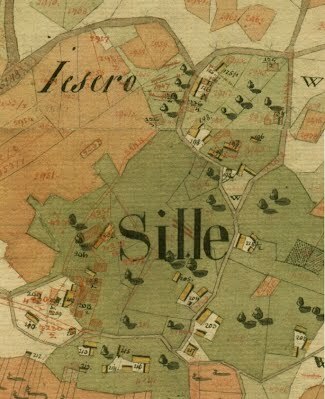 The map from 1822 shows at least 13 households, 6 of which no longer exist, and one which is abandoned. It seems the Gornji Miheli household is missing, although, added by the time of the 1868 additions. Missing from the 1868 additions is the Dolnji Hajduki household, which should have come into existence before this point.